Designed to work with any shearline, especially the KRB Miniline. It is available with an automatic entry table which lowers as the bars are being cut to provide an even, non-binding cut. Since the movable cutting head is on the input side, scrap and short pieces will fall automatically into a scrap hopper which is provided. 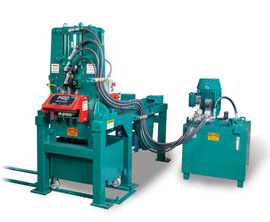 This eliminates the need for the operator to reach under the shear head to remove short pieces. This is both a time saver and a safety feature. It also permits the sheared bar to be conveyed from the shear the instant the cut is made. A hydraulic hold down on the measuring conveyor side is provided which operates automatically as the shear makes its cut.